Living in an apartment that faces north prevented me from growing my own vegetables until now. This summer, I rented a community garden plot and tried gardening for the first time. I wasn’t as successful as I had hoped, because I was (too often) too lazy to make the trip to the plot and water it. I was the most excited when a single Japanese eggplant started to grow. I proudly inspected it for a couple of weeks while researching recipes that would be worthy of this adorable, surely to be delicious, eggplant. But before it was fully grown, a rabbit ate it. I was really disappointed. Luckily, I was able to enjoy a bunch of young and tender snow pea shoots. Note that only the first or second harvests of young sprouts are good. These can be found in Asian grocery stores early in the summer. Or you could easily plant snow peas in your garden; simply follow the instructions on the seed packet. As soon as the snow pea shoots are 4 to 6 inches tall, cut them above the first forked stem (the stems can be tough). The best way to enjoy snow pea shoots is to stir fry them with some garlic and a little bit of oil. The plant will then continue to grow and give you snow peas. (See my Chinese restaurant style, stir fried snow peas with seafood recipe here.) You could also use these in Chinese steamed rice noodle rolls (cheong fun) for dim sum. Heat a non stick pan over medium high heat. Add a drizzle of oil and when the oil is hot, add the garlic. Stir fry the garlic until fragrant and softened, but do not allow it to burn. 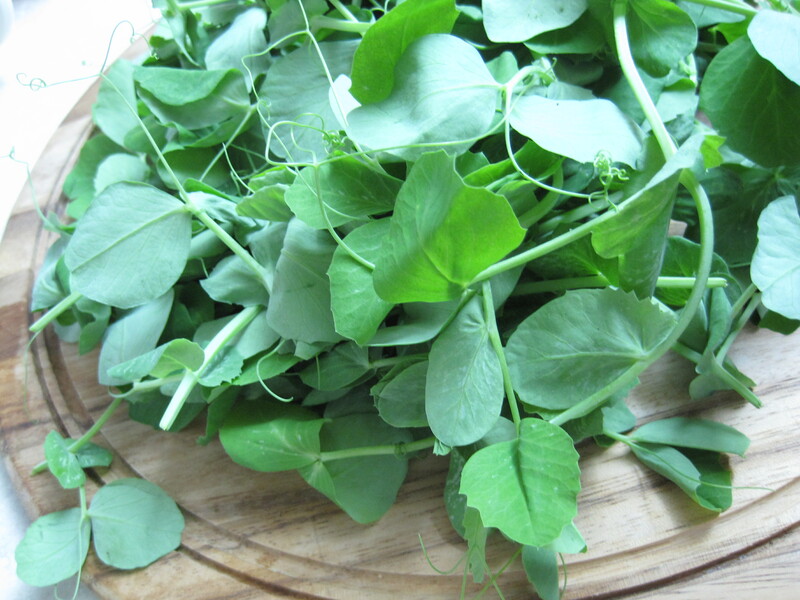 Then add the snow pea shoots and stir fry until the leaves have wilted and the stems are tender but still crisp. It will not take long; do not overcook. Add salt to taste. Dish out and serve with rice alongside other dishes. Such a shame you weren’t south facing! Well, at least you’re catching up now 😀 I think that’s a really awesome idea by the way, very commendable.